A new study from Euro RSCG Worldwide, referenced by eMarketer, shows that a fair number of people say they are more likely to “lash out” at brands online. Not a surprise. It’s been a long-time observation that people will say (or write) things online that they never would say when talking to someone directly. I just can’t help wondering. When it comes to brands and products, does that freedom to lash out mean people express more accurately what’s true for them, or less? Either way, it’s worth paying attention. 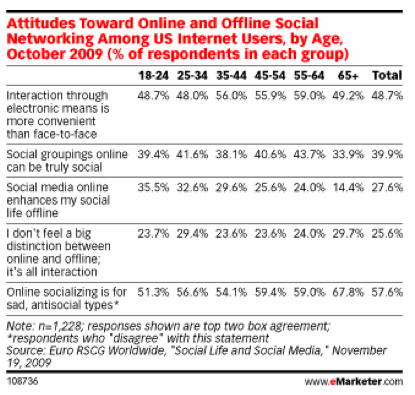 Even more interesting, something that eMarketer doesn’t mention is that contrary to what one might think at first, it’s older internet users who most disagree that online socializing is only for antisocial losers. For example, 59% of 45-54 year old’s disagree while only 51% of 18-24 year old’s do. 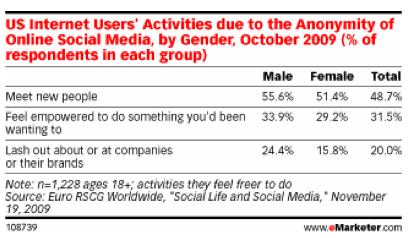 Conversely only 26% of 45-54 year old’s agree that “social media online enhances my social life offline” compared to 36% of 18-24 year old’s. So compared to us sad, old online socializers, who are apparently more content to engage with others armed with an internet connection from the comfort of our living room sofa, and go no further than that, the 18+ set more often sees online socializing as just a means to an offline end. Ah — to be 18 and old fashioned again! “Twitter is over,” my partner at work, David, constantly chides me. Even though I point out that Twitter isn’t just about telling people what you had for breakfast. He goes on, “Look what happened to Second Life, you thought that was going to change the world too. Now it’s dead.” That’s not exactly what I said. But I did say that Second Life had tremendous potential to facilitate collaboration, work processes and relationships within the enterprise. And that we hadn’t seen the last of Second Life. With the launch of Second Life Enterprise, I don’t yet get to say, “I told you so,” but the reliability of my powers of prediction is looking better. Second Life Enterprise now enables companies to use the same interface and features of Second Life on their own servers, so the content and information they place there is secure. This is a big step, because security issues were an important barrier for many companies to use the Second Life platform as a virtual workplace. The package, with a starting price of $50,000, includes VOIP, sandbox regions for virtual building and modeling, media and document file sharing, two conference centers and auditorium — virtual of course — and provides enough computing power to support eight regions and as many as 800 avatars all to work happily at the same time. Who’s using Second Life Enterprise? According to Linden Labs, 14 organizations have already signed up for the beta version, including the U.S. Navy, IBM and Northrup Grumman. It will be in beta through the fourth quarter of this year and should be broadly available by mid-2010. So maybe Second Life hasn’t changed the world yet. However, it is being used by companies and organizations for a variety of tasks from teaching and training to product development, prototyping and testing. And it allows teams of individuals from different geographies to come together at a fraction of what it would cost in “the real world.” That’s good in the best of times, and great in times like these. IBM estimated it saved $320,000 by holding a recent conference in Second Life. Northrup Grumman has used Second Life to simulate a control panel on a bomb disposal device, allowing workers to learn how to use it safely. The company now does development work for clients where “one hundred percent of the product and the client relationship is virtual.” And Second Life has enabled Northrup Grumman employees at opposite ends of the globe to work together efficiently. Beyond the firewall issue, now resolved for a mere $55,000, the biggest obstacle to broad scale usage of virtual words like Second Life is ease of use. I’ve enjoyed Second Life, but it was darned hard learning to use, at least the public version. Presuming the “learning curve” gets a lot shorter, or already has in Second Life Enterprise, I think the prognosis for a long, healthy life looks good.